are barren and childless, you are going to conceive and have a son." who would neither eat or drink anything from the grapevine nor cut his hair. The long hair would be an outward sign of an inward devotion to God. the Philistines who had oppressed Israel for forty years. way, he was acting on his head-of-household responsibilities as a man. The boy was born and was named Samson. As he grew the Lord blessed him. her the answer to the riddle. his friend who had attended him at the wedding. lifted them to his shoulders and carried them to the top of the hill. after having the wrong kind of woman. Three strikes and you're out, Samson. be deceived. God will not be mocked. strong. They wanted to capture the man who they saw as their worst enemy. secret of your strength? How could anyone tie you up and subdue you?" fresh bowstrings that the Philistines had brought her. bowstrings as if they were burning in a flame. greater than his common sense. He was "whipped" as they say these days. he said, "If I am tied with new ropes, I will be as weak as other men." Delilah then tied him with new ropes. The same thing happened as before. Samson snapped out of the ropes. 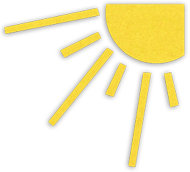 careful, Samson, you are beginning to reap what you have been sowing. gave in and told her everything. wearied with Delilah and were tired of this game. But Delilah was adamant. him, but he did not know it. work grinding grain in the prison. whole building, killing three thousand Philistines and Samson himself. marriage to a Philistine earlier. He just moved in with Delilah. longer considered a "trial marriage" either. couples ever get married to each other. enforced. Cohabitation is destroying family strength in our country. But is cohabitation not the same as "common law" marriage? It is not. cohabit have intentions to marry someday; others do not. to the flesh and he reaped destruction. 1. What made Samson's conception and birth so special? 2. Why do you think Manoah wanted to see the angel that his wife spoke of? some special vows that some religious people take today? 4. 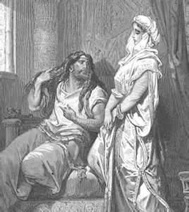 What was wrong with Samson's wanting a Philistine wife? 7. Why did Delilah want to find out from Samson the secret of his strength? 10. What happened to Samson after his hair was shaved off? 11. 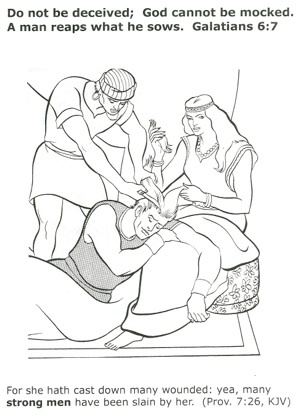 Do you think Samson truly repented of his sins? what ways cohabitation is different. P - Permanance "till death do us part." but acting as a unit. In light of this, why is it entirely appropriate and in line with the Biblical concept of marriage to say “Mr. and Mrs. John Doe” when addressing a couple? 13. How is cohabitation, as well as any type of fornication, a mockery of God and His institution of holy matrimony? 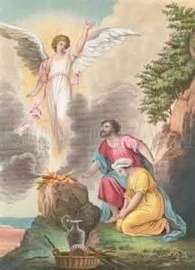 The angel confirms the words to Manoah and his wife that he had spoken before. This couple would have a special son named Samson. Much to his parent’s displeasure, Samson wanted to marry a Philistine woman, not a woman who worshipped the Lord God of Israel. 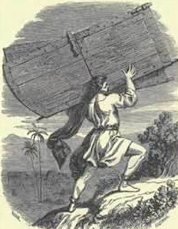 After sleeping with a prostitute in Gaza, Samson arose and escaped Gaza by tearing down its city gates and carrying them to a hilltop. 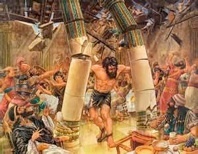 Samson’s foolish lust for the treacherous Delilah, and his cohabitation with her, led to his final downfall. 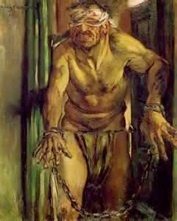 The spiritually blind Samson now became physically blind and chained as a slave when the Philistines gouged out his eyes and made him push a grindstone in their mill day after day. Samson ended his own life and three thousand others’ lives when he pulled down the two supporting pillars in the temple of the Philistines. Cohabitation is still illegal in five states: Michigan, Mississippi, Virginia, Florida, and North Carolina. Though anti-gay marriage crusaders say that gay marriage will destroy traditional marriage, the fact is that traditional marriage started eroding due to the proliferation of fornication, cohabitation, and easy divorce.